Bali, 2 October 2013 – To celebrate the launch and opening of Harper Kuta – Bali, the Harper Brand held a special Harper Giveaway competition for its friends on Facebook. In order to be in for a chance of winning, participants were asked to share and tag the Harper Giveaway on Facebook, with each mention earning them one entry to the competition. The grand prize was a round-trip flight for 2 to Bali, $400USD spending money, 3 Days and 2 Nights at Harper Kuta, airport pick up and drop off, as well as all-inclusive F&B privileges. 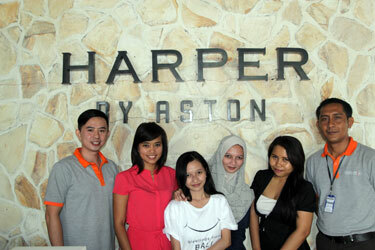 The competition was held from the 1st to the 20th August 2013 through facebook.com/HarperHotels, offering all fans on Facebook (except Harper Kuta employees) a chance to win. The winner was University student Ms. Anita Rismawati from Jakarta. With more than 4,900 friends on Facebook, Anita shared the Giveaway more than 1,500 times and tagged her friends more than 5,000 times. This meant that on average, Ms. Anita tagged and shared once every 3 minutes throughout each day of the competition. She and her sister enjoyed the complimentary stay at Harper Kuta between the 7th and 9th September 2013, complete with all of the winning privileges. “To celebrate the launching of our newest brand, we took to social media and offered a unique giveaway to our fans and friends. We've seen other hotel giveaways offering mostly just a free stay in a room, so we wanted to do something a bit different. We offered a 3 day 2 night stay, round trip flights to Bali, airport pick up and drop off, all inclusive F&B and $400USD spending cash so the winner could enjoy their holiday however they wanted. That’s what Harper is all about - allowing our extraordinary guests and clientele the setting and assistance to allow them to create their own unique holidays and memories. Follow us online and look out for the next giveaway coming up in October for one of our other brands!” says Tenaiya Brookfield, Director of E-Commerce Archipelago International. Harper Kuta – Bali boasts 149 rooms ranging from the Superior, Deluxe and Junior Suite right up to the Harper Suite. Families, couples and business travelers are all well-catered for with Adult & Kid Swimming Pools, The Meeting Room, the Rustik Bistro & Bar and The Spa. The hotel enjoys a supreme location right in the heart of Legian, just a few minutes walk from the famous streets of Poppies 1 and Poppies 2 that lead to Kuta Beach and Bali's most stylish shopping mall, Beachwalk. Snapshot of the management team of Harper Kuta and Archipelago International's team welcome the winner of Harper Giveaway, Ms. Anita Rismawati (from left to right) Mr. Christian David as Asst. PR Manager Harper Kuta, Ms. Nadiya Fabiola as Archipelago International's Corp. Online Marketing Officer, Ms. Anita Rismawati as the winner of Harper Giveaway, Ms. Risa Amelia as sister of the winner, Ms. Bonita as Archipelago International's Corp. Online Marketing Officer, and Mr. Pande as Front Office Manager Harper Kuta. Harper is the brainchild of Archipelago International, an Indonesian based hotel operator with Hawaiian roots and an underlying portfolio of more than 150 Hotels and Resorts. Modern yet infused with a rustic charm, Harper Hotels conveys a residential feel and a balanced functionality, offering unobtrusive service and never ending innovation. Harper Hotels are for the astute traveler who values individualism and character. Archipelago International is one of Indonesia’s leading hotel operators with an underlying portfolio of more than 67 hotels and 12.000 rooms and a development pipeline exceeding 90 properties in Indonesia, the Philippines and Malaysia.